Okay, so if you've been around this blog for a little while, you'll know one key fact about me: my family used to train racehorses, so I am a very horsey person. Obviously, I quite like horse movies too. War Horse looks like a particularly special one. Why? 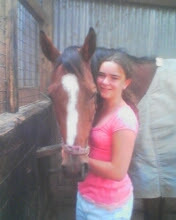 Well, allow me to tell you all a personal story about me and my horse Katie. Why am I telling this story? Because, I've heard a lot of people saying that it is quite implausible for a man and his horse who have been separated to go to the ends of the Earth to find each other. Or quite implausible that a horse would ever be a humans best friend. It happens. While my story might not involve a war of any kind, I just wanted to tell it because sometimes I miss Katie more than I can bear. And us teenagers always go on about out problems on the internet, don't we? So mine and Katie's story began sometime in late 2003, when I was eight and she was one. We leased her off someone about an hour away so we could train her. She took a while to mature, so we didn't really get her up to racing speed for quite some time. I honestly thought that Katie was the prettiest horse I've ever seen, and also the kindest. She left our land for a little while in 2006, but she returned soon after, which I was really happy about. Katie did something terribly awful on the 27th of June, 2007. She was put into a paddock in front of a horse she hadn't seen in a while, and decided it would be a good idea to kick that horse. Except, she didn't actually reach the other horse...she just got her leg stuck in the fence. Katie managed to pull herself out, though, but this didn't come without a lot of damage. Luckily, the leg wasn't amazingly bad so she didn't have to get put down. But from this day, I was put in charge of nursing her leg back to health. I had to put tons of cream on her leg, a few pots of honey on there too (manuka honey is a great natural healing agent) and take her for little walks so her leg didn't get so stiff. It was through this that we really started to form a bond. I would always give her hugs and kisses and she would do the same...well, her version of a kiss was smacking her lips together on my face. Ultra cute. After a while, the vet said that we could start taking her for little rides so her leg loosens up a bit, but there was no promise that she would get back to racing. My parents then put me in charge of riding her, since it was only light work. First we started with little walks, then some good workouts around our track, and then I started jumping her. I must admit, I got to jump her quite high, especially considering I had been a little scared of jumping since I broke both of my arms in a jumping accident when I was nine. I rode Katie quite often, before my parents decided that they would try and get her to race again. 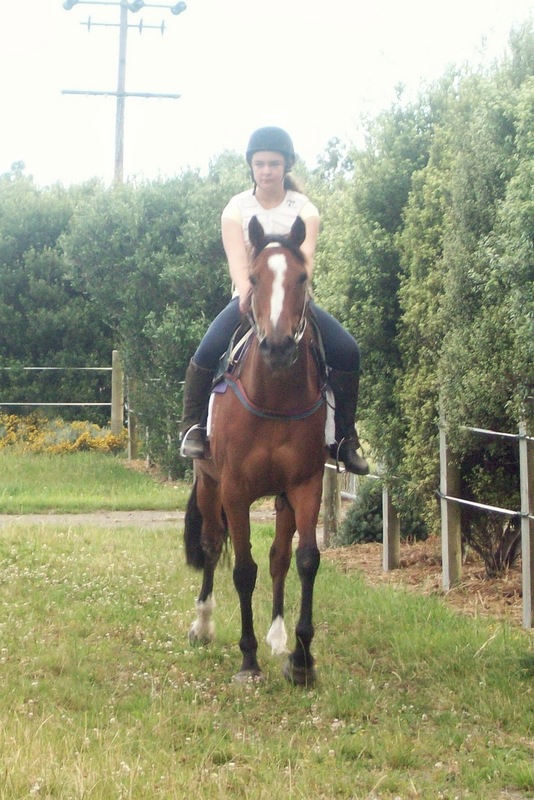 Now, Katie wasn't always the best racehorse. The starts she had before her accident didn't really offer anything too exciting. I'm sure my father always thought she was quite slow, but I kept pestering him about her and kept saying that she was going to be great one day. 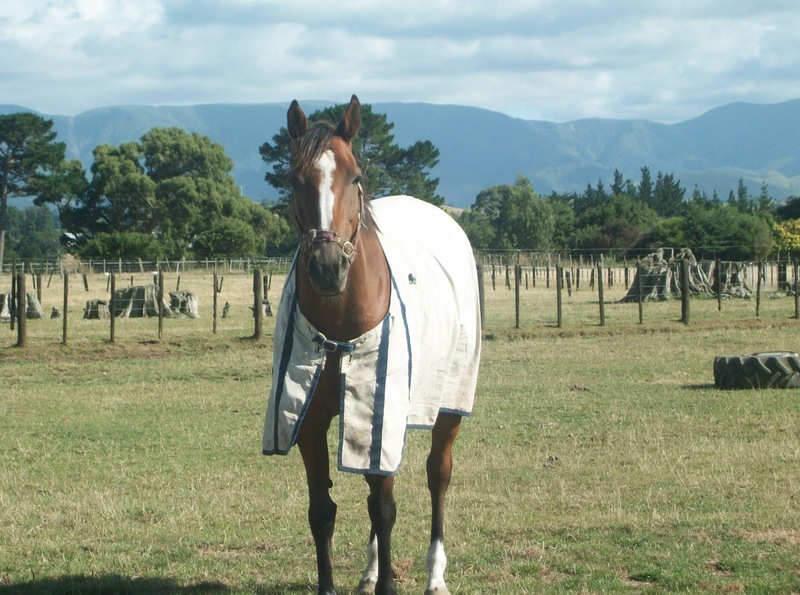 Her first few starts after her accident were quite disappointing, until she came third on her second start back. A lot of people would walk past her and see this giant wound on her leg and say that she shouldn't have been racing. But that wound didn't bother her at all. She did, however, seem bothered on race day, because she'd stand in the stall clapping her lips together nervously. It was cute. Then she'd always get strung out when I'd take her in the birdcage before her race...but I'm sure she just did this to piss me off, because otherwise she was extremely calm. July 10, 2008: possibly the best day of my life. It was the holidays, so I got to go with Mum to the races in Otaki. Katie was racing that day, and I secretly had good hopes for this start. She went out there and won. I used to get really overjoyed when our horses won, but when Katie won, I just cried and cried and cried because I was so happy. A lot of people thought she didn't win, because the other horse was so close, and mum kept saying "we don't know if she's won yet!" But I didn't really care. I was still crying, but I was worried about where I should go to collect her since she was the first (and only) horse of 'mine' that had ever won. And then there was a camera right in my ear, filming me as I cried and then gave Katie a huge hug. After that, I had to take her to go and get tested (you know, just in case she had drugs in her system or something), and this was the first time I had ever been asked for my signature. So I kinda just made one up on the spot, and I'm proud to say that it has been the same ever since. July 24, 2008: possibly the second best day of my life. It wasn't the holidays, so, despite my begging and pleading, I was not allowed to go to the races with Mum in Wanganui. After Katie's win, I wasn't really expecting that much. But do you know what? She won again. 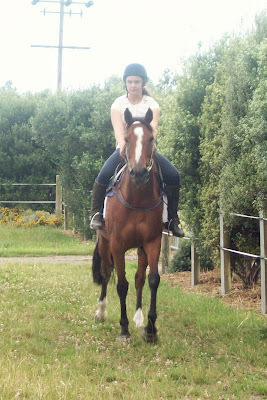 Mum said she got a lecture that day about how a horse with a leg like hers should not be racing. She also said that that day was one of the coldest, most horrible days ever, but Katie just sat there under three sheets minding her own business. Since I wasn't there, I didn't have a camera in my ear filming me as I cried, but I had another breakdown at my mum's friends house. I don't think I had ever been so excited in my life. After that, Katie had one more race and then went out for a holiday. I got to ride her lots more, continuing to jump her every morning through the Summer holidays. When school came around, I still rode her, getting up at 6am. Now you'd be lucky to see me out of bed at 7.30am. My parents prepared her for racing once more, but she was getting a little bit older and didn't seem to like racing any more. She had her last race on the 11th of June, 2009. On the 27th of June, 2009, Mum had taken me out for the day. That afternoon, I returned to my Dads, and I was a little confused because I couldn't see Katie down in her paddock. Then I got told that Dad had given her away. He had given her away without telling me. He had given her away without letting me say goodbye. I have never forgiven him for that. My entire world crashed down that day. I just cried for hours and hours and hours. This was a horse who I would always seek comfort from when my parents were fighting, a horse who I truly believed in, and a horse who got my confidence level up a lot. And now, she wasn't my horse any more. She was someone elses. I felt sad for days and days, and even now I still feel sad that she's not here with me. She was actually the last horse I ever rode, and that was a damn long time ago. I had managed to see her a couple of times a few months after she was given away. However, at the start of this year, a good year and a half since I had last seen her, I went to the local show. Me and Mum went for a walk around the yards on the off-chance that she might be there competing (she now does jumping). We walked around for ages, and had just about given up. But right at the end of all the boxes was Katie, still looking as pretty as ever, itching to get home. I ran up and gave her a huge hug, just about crying from how happy I was. She gave me a huge kiss, just like the ones she had always given me, right on the cheek. She remembered me, just as I had remembered her, and it was like we had never been apart. Even after all that time had passed by. I couldn't have been happier. So yes, I am very proud to say that a horse was my best friend. I loved Katie so much that if she happened to get sent to war, I would go after her. Just like Jeremy Irvine in War Horse. Oh, of course I am looking forward to another Steven Spielberg movie that looks immaculate and has a totally hot guy in it that I don't know that much about yet...I have got to say, the movie looks fantastic. Sure, it could be super mushy. But something that is sort of mushy happened in my life, too. I may be more excited than others about the movie, but that's only because I loved my horse too, which may be seen as weird by some of you members of the movie blogging community. I'm sure War Horse will be brilliant...I just hope it doesn't become the next The King's Speech. Haven't heard of this Spielberg film so you are one up on me! But I saw the trailers to Tintin several weeks ago and it looked impressive if I do say so myself!! The poster is out in the Readings cinema here in Napier and as a fan of the comic series I'm looking forward to it. It is about time Speiberg got back on the wagon and started making decent films again as he has been off the boil now for several years. Ah, that chilly feeling when you read the name of Steven Spielberg at the beginning of the trailer... Not very objective or... filmic-intellectual, but who cares. I must say I don't like the soundtrack, and the trailer's also a bit lame - like it follows the same ol' trailer-scheme - but most trailers don't look good, in my opinion, even those of great films. And this one, I think, is going to be at least a good film. ... Was that a glimpse of David Kross in the trailer? Wow. I'm not usually moved by stories like that, and if that were a movie, I probably wouldn't want to see it, but I must admit that was a very emotional story Stevee. I understand if people are disappointed they didn't get an actual post about WAR HORSE but sometimes it's okay to deviate away from the main subject into something which is only slightly relevant. As for the WAR HORSE movie: no, Spielberg. Just... no. I don't have any interest in War Horse, but I have to say, I would definitely watch a film based on your story. Thanks for sharing that. Brent - I think I'm more excited for this one over Tintin, but I'm sure they'll both be great! Spielberg has been off the boil for quite a while, but I don't think he'll ever be as good as he was with Schindler's List...mind you, that's like my favourite movie ever so it's hard to top! Paulo - Yes, I love my animal friends too! I know this will be a huge Oscar contender...but I don't think it will win Best Pic like many people say! Mette - Yeah, the trailers aren't that great. But I'm hoping that the film will be way better. And yes, David Kross is in the movie! Tyler - Aw, thanks! Maybe I should start writing the screenplay, haha. Bonjour Tristesse - Thank you! Look out for it next year...it'll be a huge Oscar contender, hahaha. I can definitely identify. I was pretty active engaged in horseback riding and jumping from age 8 to college (when I just didn't have time anymore) - we even moved out to the country from the suburbs so I could have a horse. My parents still have him, and board a couple of horses for neighbors, but he's pretty much retired now. 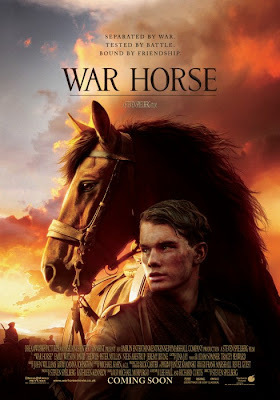 :) Intellectually, I don't think War Horse will be that great - it looks like it indulges all the sentimentality that drags Spielberg down (I'm a fan of most of his stuff, but he does tend toward that treacly edge that I just have to tune out). But damned if I don't see the posters and even the schmaltzy trailer and have all that horse craziness that used to be such a big part of my life come flooding back.